Home ​Research People Publications Diversity in STEM ​Join us! Our work links species interactions at the ecological scale with phenotypic evolution and diversification at the macroevolutionary scale. Our research lies at the nexus of ecology and evolutionary biology: we focus on understanding how plant-arthropod interactions have shaped the striking diversity found across the tree of life. To do this, we integrate a diverse set of approaches including comparative phylogenetics, community & chemical ecology, microbiome community genomics, and manipulative field experiments. How do evolutionary changes in plant traits influence interactions with other species, and vise versa, how do ecological interactions influence the evolution of plant traits over time? How do we link ecology and macroevolution over deep-time? 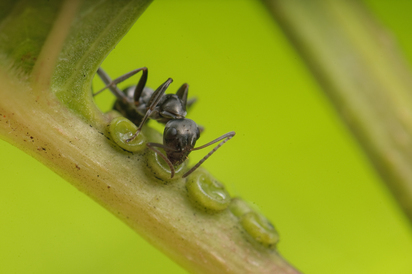 What are the evolutionary causes and consequences of plant-bodyguard defense mutualisms? Do ecological hypotheses predict macroevolutionary trajectories of traits that mediate plant-arthropod interactions? What is the role of microbes in mediating the evolution of arthropod interaction traits? Check out our publications for more details!